Our very limited edition: Diva had 1 boy and 2 girls! 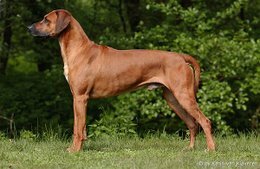 Ulanyo was imported from South Africa to Germany as a puppy, however, he is half-australian through his sire. 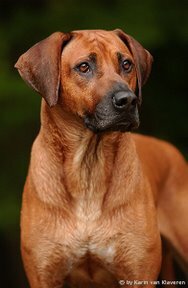 To me he embodies the ideal image of a Ridgeback: self-confident, laidback and friendly in character, absolutely healthy, successful in the showrings but most and foremost a superb working dog, who is showing terriffic skills especially in the tracking sector. Only few RR´s are that versatile today, so I feel very fortunate being allowed to use him in our breeding programme. Although I know him since he was a youngster, it took me a little while to "find" him. This might be due to his late maturity and for the fact that his owner started campaigning him more intensively in 2006. The final decision brought a closer look at his very promising offspring, and we are now looking forward to a similar result in combination with "Diva". 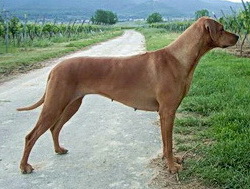 Ulanyo´s litter sister is RSA Ch Glenaffric Bella the Ball of Roodedraai, a BIS-winner. She is residing at the well-known "Roodedraai" Kennels, owned by Mrs Yvonne du Preez in South Africa. Diva is our imported girl from Australia, who has already proven that she is no slouch in the show-department, too. Altough at times she can be a real Princess she is uncomlicated and a joy to live with. She is especially relaxed with our children. As a young girl she showed great promise in tracking, however I had to stop training due to my own maternal duties. 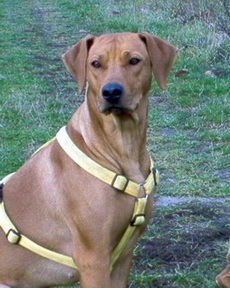 Diva is a dog that usually wants to please (Ridgeback-factor ;o)! ) and enjoys retrieving, little search games and cycling. In addition she is also the proud dam of our promising A-litter, whose kids managed two BISS-wins, two Junior Championships and a Clubchampionship so far. I am also very pleased with the characters of the babies she has produced for us together with Gianni. Diva is a carrier for the Livernose-gene through her sire. Out of the combination of Diva and Ulanyo we have every reason to hope for the best, regarding both mentality and health. Even more, if everything goes to plan the resulting pups should not only be loyal family dogs, but also be able to perform well in the fields showing and working. My sincerest thankyou to Ulanyo´s owners Jana and Jan Mach for allowing me to use their lovely boy! Please click here to view a pictorial 6-generation-pedigree! +49 6321 480 420 to register interest in acquiring a pup or for further information.